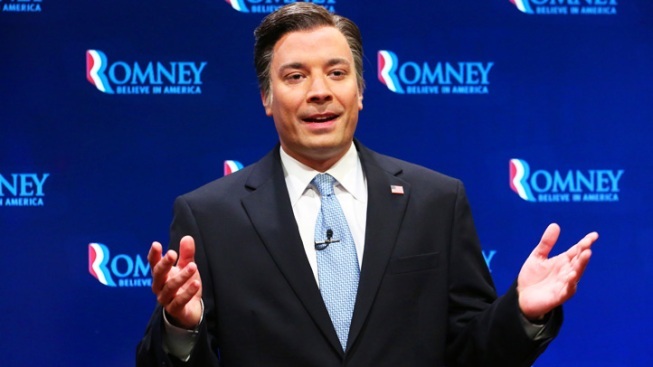 Jimmy Fallon plays Mitt Romney after the first presidential debate. Rather than take shots at President Barack Obama or Mitt Romney after the pair squared off in their first presidential debate, Jimmy Fallon poked at moderator Jim Lehrer on Thursday's "Late Night." Lehrer has been criticized for failing to keep control as both debaters regularly ran over their time -- and Fallon piled on. Playing the role of Romney, Fallon repeatedly told Lehrer to shut up. "Jim, I just politely gotta hush you up," Fallon's Romney said in one exchange. "Hush, child." "Jim Lehrer," played by A.D. Miles, tries to respond, but each time he's met with another round of insults. "Well I think it's a little weird that you're here, still," Fallon says midway through the barrage. By the end of the 3-minute skit, "President Obama" has joined in with profanities. Both candidates eventually agree that their moderator should "shut the f--- up."